Ken Ketchum BIO: Ken’s approach to photography comes from years of painting and drawing. Now the images are painted with light, yet, his motivation is still to capture visual poetry through form, color, and composition. Mark Morgan BIO: Mark Morgan, a longtime resident of West Seattle, was introduced to photography by his father. This began a passion that would endure the intervening 41 years. Mark uses his camera to document glimpses of the unexpected and views of his world from new perspectives. Janet Cooper Every stone has it’s own meaning and unique expression. My passion is to turn them into beautiful expressions of jewelry. 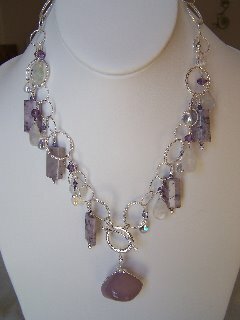 I began creating jewelry about four years ago when trying to decide what to do with a special amethyst necklace that had broken. Fred Detore and James Privette: Emerald Cove Catering BIO: Fred Detore, started his love for cooking while watching his mother in the kitchen as a small child. At the age of 13 he started his tenure in the restaurant business. James Privette attended South Seattle Culinary Arts School. He met Fred while working at the Palisades Restaurant. Cooking alongside each other the two became fast friends.